After a couple of gray weeks apparently borrowed from someone else’s monsoon season, the Valley has returned to its regularly scheduled fall. Leaves have begun filling up roadsides, and there’s finally a hint of chill in the air. It feels like New England again. In the midst of that change, Art in the Orchard is a solidly realized expression of new and old New England. Head over to Park Hill Orchard, off the beaten path but not far from downtown Easthampton, and you’ll find a sculpture exhibition on a trail through the grounds, open for self-guided tours. A word of warning: if you visit Art in the Orchard, go prepared. For the wooded section, you’ll find a basket with complimentary natural insect repellent. You’ll need waterproof footwear, and you should expect to exit with mud-flecked togs, thanks to navigating two-by-eights (partially) crossing large puddles. The beauty of Art in the Orchard is its combination of bucolic backroad New England and the more recently arrived culture of the art-fueled Valley. The project is a collaboration between the owners of Park Hill Orchard (Alane Hartley and Russell Braen) and Jean-Pierre Pasche, owner of Eastmont Custom Framing. Sculptor Matt Evald Johnson advised them, and his work is some of the most awe-inspiring of Art in the Orchard. 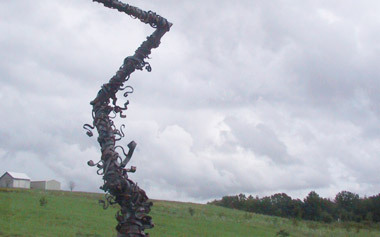 The tour begins across the road from the Orchard farm stand, and the sculptures on that side of the road include Johnson’s “Zag,” a very tall metal assemblage that, when paired with a restless autumn sky, looks like a reverse lightning strike. Near it, you’ll find some of the exhibition’s other standouts, including Laurie Frazer’s “Circle Rays Trellis,” a metal sculpture whose delicate lines frame the distant mountains and echo the breezy sophistication of mid-century design, as well as Bob Turan’s “Music of the Squares,” which forms a dramatic trio with the others that seems right at home atop its otherwise unassuming hill. Among the remaining sculptures, you’ll find some that don’t hold up to the high standard of Johnson, Frazer and Turan, works that don’t reveal extensive engagement with and transforming of their media, or which only work from one particular angle. That said, two other works go quite far in interacting or combining with their surroundings, and it’s in such instances that an outdoor sculpture exhibition really finds its raison d’etre. By the time you reach Maggie Nowinski’s work, down a trail into the forest, you’ve had to try an interesting exercise: picking out from afar what’s sculpture and what’s part of the orchard. It brought to mind an assertion an old professor of mine once made—he had no patience for the broad question “What is art?”, and maintained that anything and everything made by human hands is art. It’s a generous and productive view, and walking to Nowinski’s work was deepened by that approach thanks to not knowing where “art” began in the presence of an old abandoned car, crates full of slate shingles, and other such detritus. Nowinski’s work consists of many castings of lips set into the trunk of a large tree, and it comes to aural life on Saturday afternoons from 1 to 5 p.m., when a recording emanates from the strange tree. The details of the recording process—a multi-stage event in which a narrative underwent intentional deterioration through repetition and interaction with spellcheck—are themselves worthy of a story. It’s easy to feel as if you’ve stumbled onto some scene from a fantasy novel, as if her work magically grew in the forest. In the middle of the orchard, you’ll find Robert Markey’s “Emergence,” a sort of unfolding crown with a sphere in its center. It’s surrounded by large, concentric rings of plantings, and seems like another magical instance, perhaps one in which the surrounding plants have arrayed themselves for an otherwordly ceremony. You can visit Art in the Orchard through the end of the month. In the pleasant beginning of a New England fall, it’s a rewarding experience to wade into the wet orchard and let questions of old and new, nature and art spring from the fertile ground.